It’s been a busy couple of weeks- just like when I kept a diary when I was a kid, the absence of an entry generally meant that I was doing more exciting stuff than usual and had less time to write about it! A couple of weekends ago I was training in the Peak District, based at the fantastic Losehill House Hotel. On the Saturday we did a 10 mile run up Lose Hill, over the ridge to Mam Tor, down to Castleton, back up Back Tor to Lose Hill and then down to the hotel. The tops were covered in snow and unfortunately I had not packed my trail or fell shoes, so I was skiing down the snow and ice in road shoes- certainly hair-raising! The Sunday we did training for the Atlas Mountains, carrying heavy packs from Edale up to Kinder Scout and back. The 18 kilos on my back felt light and the hail and unexpected white-out on the top was certainly memorable. 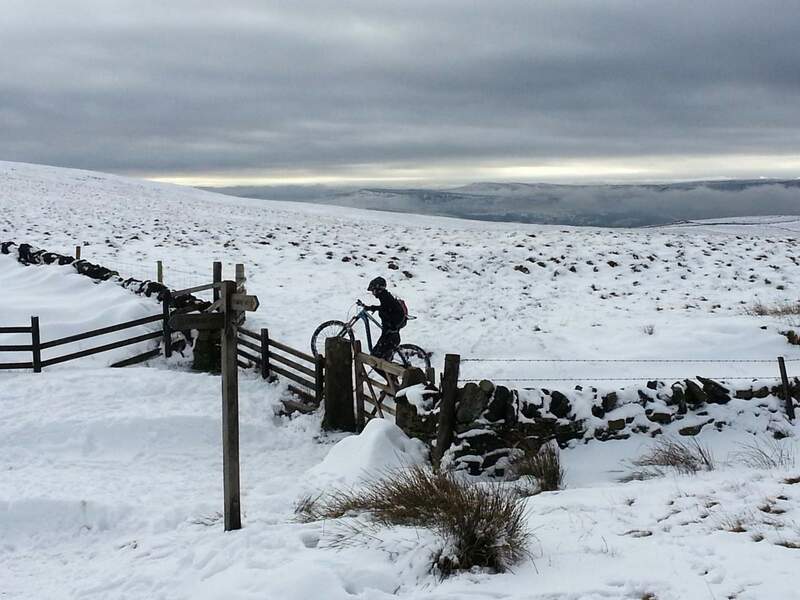 A mountain biker carries their bike over a thick blanket of snow. I’ve also started thinking about my first sprint distance triathlon of the season in East Leake. I’ve baselined my 5km run time and am hoping to shave off a minute (or two) over the next six weeks. Getting back into the pool, I was surprised that I had not lost significant speed after months of not swimming. I haven’t started back on the bike, but am planning on moving my turbo trainer back into the living room next week after the Atlas Mountains. Last Thursday I also found out that my ballot entry for the London Olympic distance triathlon was picked, so I’ve got that to look forward to as well. Last weekend I concluded my training for the Atlas Mountains: one final push up and down a snowy Snowdon via Llanberis path with a 23kg pack and my Scarpa Mont Blanc boots. I’m very impressed with these boots- they have a solid sole that doesn’t flex much, but can still feel the terrain underfoot. Tomorrow I’m going indoor ice-climbing; just an excuse to play on ice before Morocco. My next post will either be in Morocco or upon my return.